Winner: City of Camden Dept. of Planning and Development, Hillier Architecture, and Parkside Business and Community in Partnership, Inc.
Camden has suffered the fate of so many of New Jersey’s older cities, with past industrial glories overshadowed by today’s problems that suburbanization has left in its wake: middle class flight, lack of infrastructure investment, industries and businesses leaving town. Camden’s Parkside neighborhood is no different – in recent years, it has faced a rapidly declining population, a deteriorating housing stock, and a languishing commercial corridor along Haddon Avenue. Yet, the neighborhood remains one of Camden’s finest residential areas, boasts a higher percentage of home ownership than the City overall, and contains a close-knit community of residents that are interested in the future of Parkside. It is this strong community coupled with the presence of amenities such as neighborhood schools, parks and trails, and a strong neighborhood organization, that formed the basis of the neighborhood’s innovative new community-based redevelopment plan. 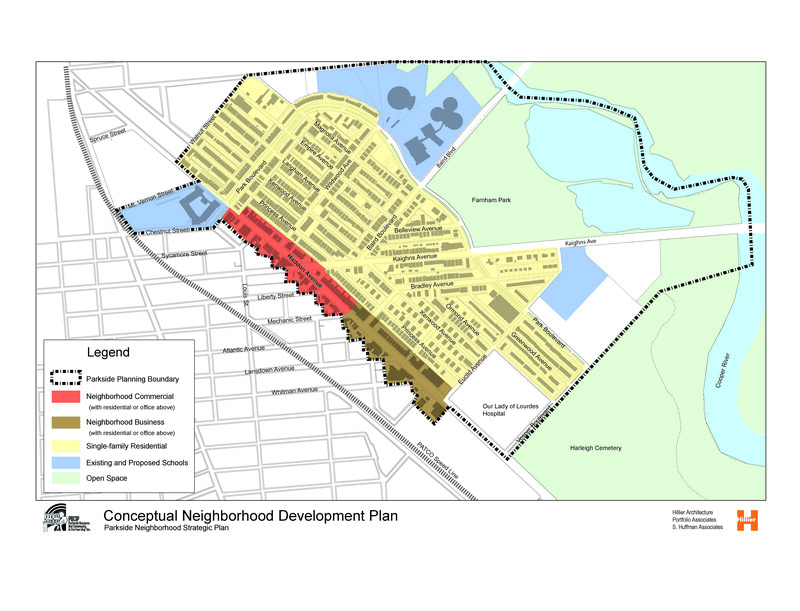 The Parkside Neighborhood Strategic Plan represents a finely detailed revitalization plan for the neighborhood and is the result of an exemplary collaboration between the planning consultant, a neighborhood group, and the neighborhood’s residents. Following unanimous approval by the Camden Planning Board of the Parkside Redevelopment Plan, Parkside Business & Community in Partnership, Inc. (PBCIP), neighborhood-based non-profit community development agency, retained Hiller Architecture to create a Strategic Neighborhood Plan. Broad and comprehensive community outreach was of the utmost importance; to achieve this goal, PBCIP convened three community meetings that attracted over 600 residents to outline a vision for the neighborhood. In addition, resident surveys were distributed and the team met with a number of community stakeholders, both formally and informally, to guide the development of the plan. The neighborhood vision articulated at the public meetings established a number of broad goals for the future of the Parkside neighborhood. From the neighborhood vision, the plan was conceived. The plan provides a wide-ranging road map of projects and programs to accomplish the vision, and the development team presented recommendations and specific implementation strategies that are feasible for PBCIP, with partner agencies, to accomplish. Development initiatives recommended are organized into two categories: special projects and redevelopment projects. Special projects are initiatives in and around the study area that have specific sites for which a plan is proposed or underway; they include a new elementary school and a new middle school, a new early child development center, a mixed-use civic center, the renovation of two existing schools, a new senior housing development, a senior center, a new fire station, targeted housing rehabilitation and infill construction along a number of blocks in the neighborhood, and the expansion of a local hospital. Each project has a corresponding “fact sheet” that outlines a description, development entity, and schedule. Redevelopment projects are initiatives that address larger areas within the neighborhood. These projects could be advanced by a developer or development partnership and include a combination of infill development, adaptive reuse, selective demolition, and public space activities to affect a larger portion of the neighborhood. 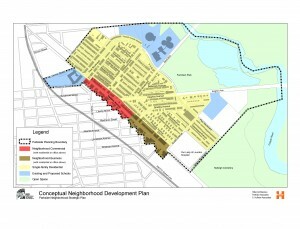 Initiatives include plans to: maintain and enhance the historic single-family residential character of the neighborhood; modernize and preserve existing housing stock wherever possible; provide new family housing on vacant lots; preserve blocks with significant historic value; provide new mixed-use housing as a buffer between single-family and industrial areas; restore Haddon Avenue as a vibrant commercial strip by consolidating the retail portions of the street and improving the appearance and safety of the corridor; restore Farnham Park, establish a number of community gardens, and encourage community use of educational facilities and resources; and increase civic engagement. This plan highlights the importance and value of community-based planning; thanks to the extensive work of the city of Camden, Hillier Architecture, PBCIP, and the residents of Parkside, Parkside has become one of Camden’s most promising neighborhoods. The seeds sown by this effort are only beginning to take root.